What is the Condition of Lumbar Spinal Stenosis? A Lumbar spinal stenosis is a condition where the tube in the middle of the spine (spinal canal) is narrowed. 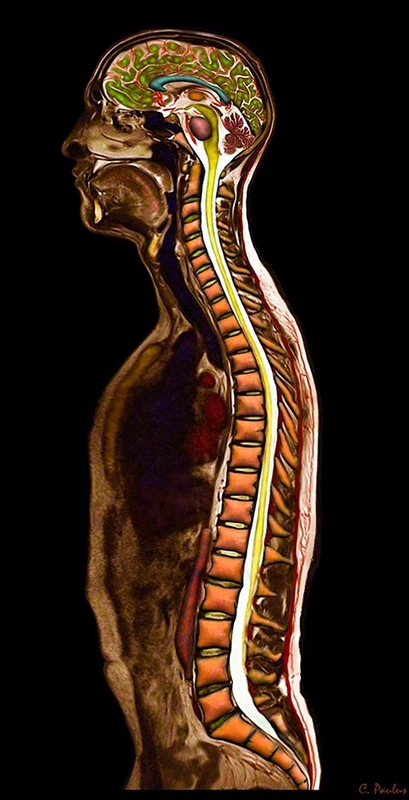 Since the important neurological structures, the spinal cord, cauda equina and spinal nerves are located in this spinal canal, this condition can affect them. The lumbar spine has the spinal cord present only at the upper most levels (L-1, L-2). Below that level, the cauda equina (large bundle of nerves) is located in the spinal canal and can be affected by spinal stenosis. Figure 1: This illustration is a cross-section (slice cut across the spine) of a normal vertebra. The front of the spine is at the bottom, and the back at the top. The spinal canal is shown located in the center of the vertebra surrounded by bone. The spinal cord (cauda equina) is seen in the center of the spinal canal. Figure 2: This illustration is a cross-section (slice cut across the spine) of a normal vertebra. The front of the spine is at the bottom, and the back at the top. The spinal canal is shown much smaller than in Figure 1. It is reduced in size due to a disc herniation which is pushing into the spinal canal, taking up space. This is called “spinal stenosis”. 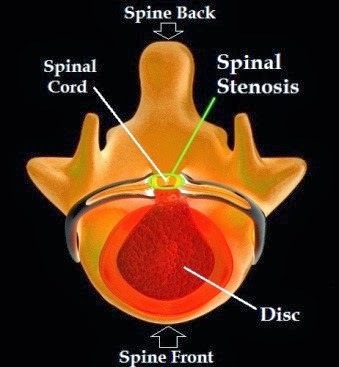 How does Lumbar Spinal Stenosis develop? 1. Discs which bulge, protrude, or herniate into the spinal canal from the front. This Image shows the Low Back (lumbar spine) from the side. The front of the Spine is to the left. 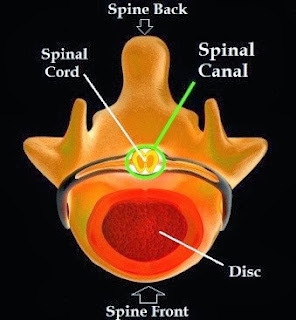 The Discs between the Vertebrae are shown in green. 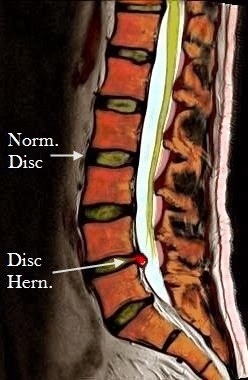 A Disc Herniation is seen in red. 2. Bone spurs which develop on the vertebral body or facet joints from the back. This Image shows the Low Back (lumbar spine) from the side. The front of the Spine is to the left. The Discs between the Vertebrae are shown in green. A Degenerated Disc is seen in red. Bone Spurs have formed at the Degenerated Disc and at the Degenerated Joints. 4. Some patients have a small spinal canal from birth and are at a higher risk to develop spinal stenosis. How much smaller does the Spinal Canal get in Lumbar Spinal Stenosis? A normal size for a spinal canal in the neck is 17 to 18mm in diameter, about the size of a penny. 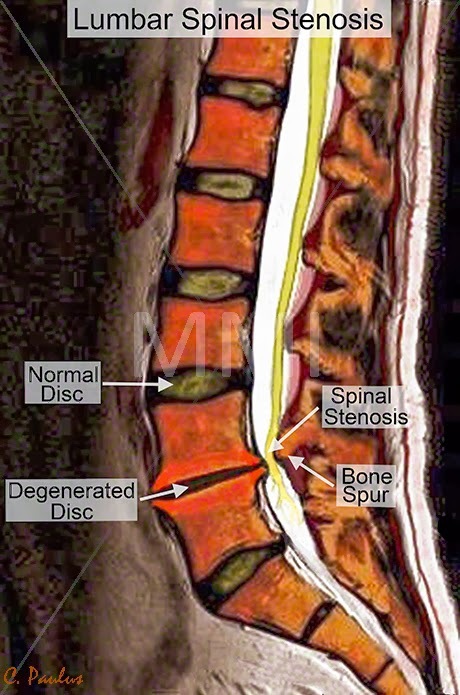 When the canal narrows to 13mm or less, spinal stenosis exists. When the diameter is reduced to 10mm or less, the stenosis is deemed to be severe. 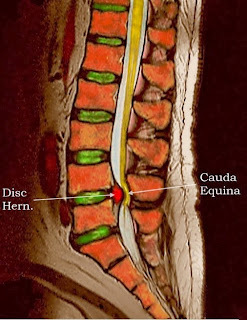 Cauda Equina Syndrome is a condition where there is an acute loss of the function of the lumbar and sacral spinal nerves, below the level of the spinal cord. This is commonly a neurological emergency, and may require emergency surgery. Cauda Equina Syndrome can happen in extremely severe cases of spinal stenosis, where the spinal canal only has a few mm of space remaining. This image is an MRI scan of the low-back (lumbar spine) which shows the spine from the side. The front of the spine is to the left. The vertebrae are shown in orange, separated by the normal discs in green. A large disc herniation has developed at the second lowest disc in the spine. It is shown in red. The cauda equine (bundle of nerves below the spinal cord) is seen in yellow. It is severely compressed by the large disc herniation.